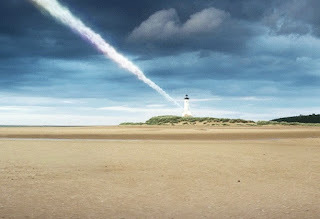 An object burns through the Earth's atmosphere and smashes into a lighthouse somewhere in the swamplands of the southern United States. Slowly, things in the area begin to mutate in inexplicable ways. A strange "shimmer" appears over the area and this shimmer begins to grow in size. The area is evacuated and the authorities send teams into The Shimmer, which they refer to as Area X, but no one from these teams ever comes back and as soon as they enter The Shimmer they become cut off from the outside world. Communications devices don't work, compasses refuse to obey their magnetic imperative, even human memories are warped and seemingly wiped away. Everything is changed. The is the setup for the plot of the newly released film, Annihilation, by British writer/director, Alex Garland. Amongst other credits, Garland wrote The Beach, 28 Days Later, Sunshine and Dredd and his directorial debut, which he also wrote, was Ex Machina, a film I also loved and discussed HERE. Annihilation is not originally a story of Garland's but is a book, part of a trilogy, by Jeff Vandermeer. I had not heard of the book and so neither do I have any knowledge of how the story in the book differs from the film although I understand it does. Garland re-wrote the story for the screen as a memory of reading the book and so he has taken a few new directions of his own - with the original author's permission. In what follows there may be a few gentle spoilers for the film so if that bothers you now is the time to bail. I intend to discuss its themes and ideas arising from the film in the main. 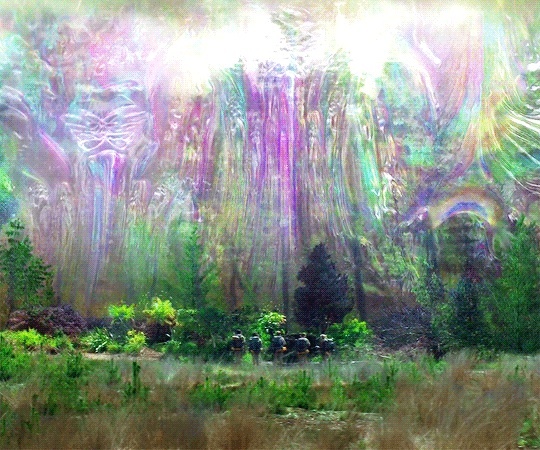 If we ask what Annihilation is about perhaps the answer that gets to the heart of the many themes skillfully threaded through it is CHANGE. A metaphor running through the on screen action is that of a cell which divides, as cells always do since this, at cellular level, is exactly what life is, a ceaseless reproduction of cells, a division of the one into more of the same. The absence of this behaviour is death and cells which did not die would be immortal. A character in the film remarks how this death is actually a genetic fault. Cells should live forever. Yet we see death as the pre-ordained outcome of life, creation which carries within it the seeds of destruction. Yet even this death of cells would not be the end for from death always comes new life even as fruit, once part of a growing plant, once picked, ceases to live yet, as it rots, new life uses it as a source of its own, a ceaseless dance of life/death or death/life. 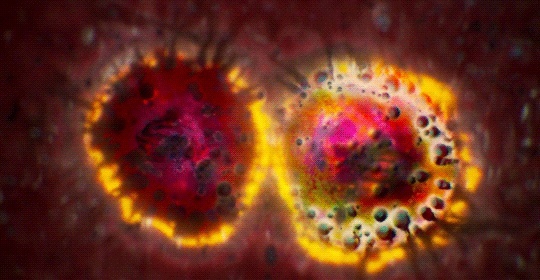 From the cellular perspective things are always changing for cells are always dividing and sometimes mutating. We are literally not the people we used to be and are constantly becoming someone new. As I explained in the setup, inside The Shimmer the rules are changed and "change" itself is the guiding principle. 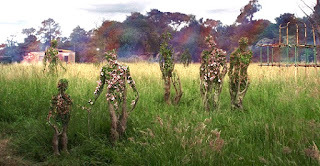 We see numerous plants and creatures in the film that should not exist, strange admixtures of DNA that have created (or destroyed, from another point of view) strange chimera. We also see that in The Shimmer duplicates of things can be created and these duplicates can even retain memories or personal characteristics. Here the guiding metaphor is that creation is destruction is creation, creation and destruction are functionally THE SAME THING. When something is destroyed something else is created, when something is created something else has been destroyed. This is inevitable and unavoidable. We carry this destruction as creation within us. Each of us was created and yet within us we carry the genetic material of our own destruction... which will lead to the creation of something else in a functionally endless cycle. We can no more end this destruction than we could affect our creation. One symbol of this is an ouroboros tattoo which plays a part in the plot of the film. It symbolises infinity. One character, exposed to The Shimmer, is asked about what has happened to him and he answers, "What does it matter?" a person alone in the context of the forever actions of creation and destruction that he cannot stop for he is changing, creatively and destructively, even as he speaks. This theme is also played with in the film in the context of self-destruction. He, like all of us, is change. Not only is this physically true, we literally are the engines of our own change and eventual death, but also psychologically, we have self-destructive urges which destroy our characters and create new ones as the film makes clear. This also has a social application as each "cell" of society, each of us, changes and so changes society itself which is the greater organism. Change, destruction and creation are very basic themes behind the film without giving away too much plot. But I now want to discuss some of the ideas arising. One such is the idea of human identity which is something we all highly prize but which, in cosmic context, is insignificant, empty and meaningless. That which makes up all that is takes up human identity for only infinitesimal fractions of its existence and amounts to a vanishingly small percentage of the whole and yet, as those identities, we value them highly in a way that the rest of the cosmos simply does not. For things in general do not concern themselves with what they are. Such a thing is irrelevant and neither was it any purpose. Cancer, for example, another metaphor in the film, does not want or desire anything. It would be useless to ask it what it was doing and why. It just functions. In a similar way it is useless to ask any cell why it divides, why it reproduces and survives. It just does. There is no purpose, no desire, no will here. Only function. Applying this to identity it becomes clear that human life equally has no purpose, and its not remotely important that you or I as specific examples of it exist. You specifically are merely a vehicle for something else and self-importance, importance as yourself, is utterly misplaced. Self merely facilitates survival. And survival occurs not through static identity but through change. So, echoing that earlier character, "What does it matter?" We are collections of cells that grow and then die in which our identity was not the point of the exercise but merely the means, the means to certain genes reproducing and surviving if they can. I mentioned earlier that in The Shimmer memory fades or even disappears, unsurprising if everything there is exaggerated change, but what would lack of memory do to your identity? Don't you literally need your memory to be who you are, to remember who you are? Isn't identity partly based on the notion that you can remember a narrative of self that tells you who you are? And then there is the issue of the duplicates that The Shimmer can generate. Does "another you" change who you are or recontextualise it? In all this identity talk I am powerfully reminded of Buddhist or Taoist notions that there actually is no "self". These spiritual outlooks regard this as an illusion, something to be got past. They view it as a static way of seeing what is actually moving and so not a very helpful way of seeing, one at odds with their view of life as constant change, an ever-changing stream of "now moments." In the cosmic context of Annihilation (the film and the existential fact) this is brought more clearly into focus. This highlights for me a facet of my own character that I have always noticed. When I was a teenager, at that age when people at school or parents ask you "what you want to do with your life," I instinctively knew my answer: I wanted stability, a stable, secure situation that I could imagine lasting forever. This, of course, was naive and unrealistic and you will be unsurprised to learn that it hasn't turned out that way. Yet its worth thinking about for a moment. I did not want wealth or fame or even a salary. Just give me stability, a static life of known quantities. It is ironic that in the light of the themes of Annihilation I was wishing for the one thing I could never have. I was, perhaps, even wishing for a metaphorical divinity, the ability to be forever the same, unchanging, ineffable. I did not realise that I am part of the realm of change, of creation and destruction, of annihilation. I am myself change, destruction, creation, annihilation. Coming to appreciate this is a part of an appreciation of what we are, of human being, of what being means. We think of will and purpose as essential characteristics of self, of identity, but are they too just functions, means to that eternal end of reproduction and survival? It may be important to you WHAT you want but at another level perhaps it is only important THAT you want and that this illusion of self enables reproduction and survival, the functions of existence, the eternal story that is blotted out by several billion egos that think they matter but don't even realise they never really mattered at all and will soon not exist as themselves anymore. This understanding can become spiritual or mystical and Annihilation hints at this (not least in its ending which I won't give away) and sometimes seems to regard this forever change in which we are submerged and of which we are irredeemably a part as the greater context to life which many religionists conceptualise as a divinity of some kind. I myself can do this and when I think of my own annihilation, as I often have, I can only regard it as a peaceful, mystical experience, not something to be afraid of but something for which I was always destined. (Of course the physical signs may be more traumatic as we daily notice ourselves falling apart.) The character Ventress in the film seems to take this view and her story is a very visual representation of this. It is naturally human to muse about that which is beyond it and this film does a similar thing in an engaging way that is not immediately obvious and with numerous twists. It is a film for people who think about who they are or why they are... or even why anything is. It discusses life, what it is, what contextualises and conditions it, and tells a few home truths about human beings and their self-destructive urges. It does this in a way which perhaps questions if we can even help ourselves when we do this. But then, what does it matter? Everything that comes to be changes, everything that is is changing. Everything faces annihilation. Do we embrace it or resist it? What does it matter?